Some pics of our garden. Soaker hose layout. Connected them to the sprinker zone a few weeks back=good stuff. My son spent the morning with me doing yard work. Hoping he inherits a green thumb and appreciation for nature doing things like this. Bed is 8' x 5'. Soaker hose is 50ft. This bed gets sun exposure from about noon til sundown. The hardi-plank siding on the house holds a lot of heat into the evening hours so hot climate plants do well here. Empty bed space will be filled up with basil and pepper plants. I've pondered tearing up another foot of grass to expand use of this area. What a wonderful garden you have! Everything looks great. Keep those pics coming. Looks great! I'd like to get my garden area to look that clean. I'm kind of Jealous! But looks great... And I keep starting my seeds inside, and they never turn out as good as if I start them outside. I think I may end up doing that next time. 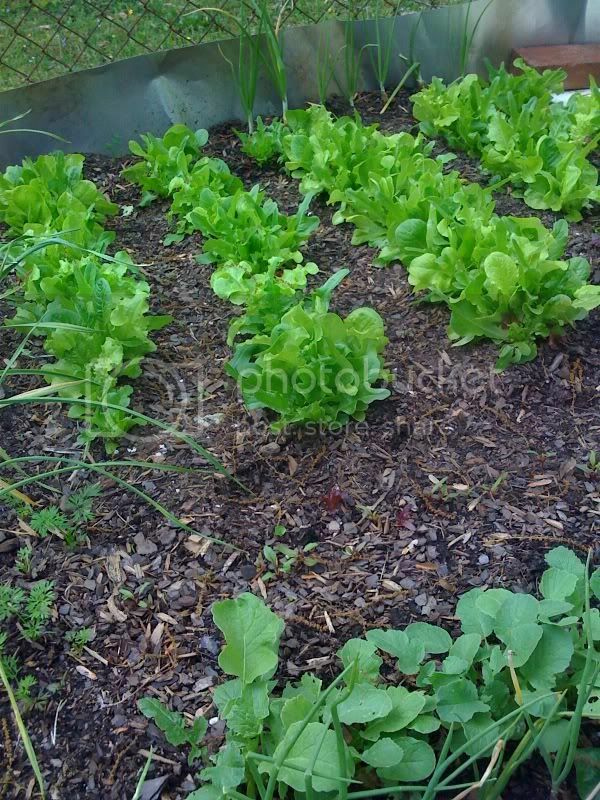 Here's a little pic of some of my lettuce, with radishes in the foreground and some beets just up in the mid-ground. Oh, and with onions and garlic ringing the whole plot. oldschoolvdub wrote: Looks great! I'd like to get my garden area to look that clean. I'm kind of Jealous! But looks great... And I keep starting my seeds inside, and they never turn out as good as if I start them outside. I think I may end up doing that next time. I've found that using a grow light this year has done the trick well. Last year I had leggy sprouts that damped off. This year with a grow light and proper draining medium I've seen very good results. THinking the secondaries on these got fried by my grow light being a little low? The peppers have definitely taken their time. How dry should I let the soil in the seedling pots get before I water? I've been watering from the bottom every three to four days, but there is still a little bit of moisture in the soil when I do this. Curious if I am not letting them dry out enough between waterings? What's causing the yellowing on these leaves of my tomatoes? Do folks ever trim these leaves from these young plants to redirect the plants energy to the new growth? They spend the days outside in the sunlight and night under a fluorescent light. I've seen pics online of good results with basil under 24hr grow lights, but curious if any plants actually need time to rest at night? Cucumbers have spent the last five days or so out in the garage and outside to harden off and have been doing well so I took the next step to get them into the garden. 23 days old from seed. The roots penetrated the paper divider in a few places, but overall the dividers did their job as the four quarters pulled apart pretty easily. Putting plastic pots over them for the first few nights. I'll be putting up string to train these up onto the frame. Tomatoes are coming along nicely as well. The biggest of the Romas and the biggest of the Beefsteak went into the ground today, one each. Those in the image will be given away to friends here in a month or so. Will be cool to see them do well in other yards and enjoyed by friends. Basil is coming along. Next year I'll plant a few more seeds in a smaller area and just move them together in a clump of multiple plants. Potted using ~75% plain potting soil and ~25% perlite. I also planted some more basil seeds but instead of just straight coir, I mixed in about 40% perlite. The straight coir seemed to stay a little too damp. Think the perlite will help with drainage. One of my basil seed pots didn't appear to germinate with exception of one seed which died before really breaking the surface. The ten or so seeds were potted with 100% coir. Need more basil starters so I potted up some seeds w/ 40% perlite/60% coir and kept the seeds almost just on the surface. Barely covered with soil. This time I put in a few toothpicks and draped saran wrap over them to keep the moisture/humidity in but not on the surface. I'm going to slowly remove the saran wrap over a few days to fully expose the seedlings. I also did this to basil seeds in five other cells 48 hours ago which appear to be doing the same thing. What is causing these leaves to darken on the edges of this pepper plant? I'm pretty sure the middle bottom basil plant is genovese, but I am not sure of the other two. I planted lettuce leaf basil seeds as well as genovese basil seeds. Are those lettuce leaf basil plants? Peppers are coming along nicely. Happy about the jalapeno on the right as it was not doing so well until it got potted up. Much better results with the basil this go around. Will let these come up as is in clumps. Regarding my post above, the darkness on the pepper leaves is possibly due to lack of nutrients so I poured some 1/2 strength MG water on these to see what they'd do. Need some warmer weather now to plant! Hey SG! Things seem to be going swimmingly Yellowing leaves are often a result of overwatering(especially with plants that are in containers). Wait a few more days between waterings and see what happens...or if you want, you can probably wait until the plants look physically different(a little droopy) before watering to get a good idea of how long you can go between waterings. Do your containers have good drainage? This is a must for container gardening as well. James282 wrote: Hey SG! Things seem to be going swimmingly Yellowing leaves are often a result of overwatering(especially with plants that are in containers). Wait a few more days between waterings and see what happens...or if you want, you can probably wait until the plants look physically different(a little droopy) before watering to get a good idea of how long you can go between waterings. Yes - I made this mistake previously. I now mix ~40% perlite with ~60% potting soil and wait until the mix is almost dried out before watering. The darkening of the pepper foliage is what was concerning me.